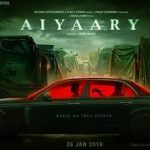 Aiyaary is an upcoming Bollywood movie based on real incidents. Aiyaary is directed by Neeraj Pandey and co-produced by Shital Bhatia and Neeraj Pandey. Manoj Bajpayee, Sidharth Malhotra, Rakul Preet Singh and Anupam Kher are in lead roles in the movie. Besides Aiyaari, Rajnikanth most anticipated movie 2.0 will also release in January 2018. Actor Siddharth Malhotra has completed shooting for the remake of the film “Ittefaq” and soon he will start shooting for the movie ‘Aiyaari’ in Kashmir. Siddhartha said during the live GQ Awards ceremony on Sunday night, “I have just finished the shoot of ‘Ittefaq’, and I am going to start shooting for Neeraj Pandey’s film ‘Aiyaari’ soon. I am preparing for my role and I’m excited about shooting. ” Neeraj Pandey will direct the film ‘Aiyar’ Manoj Bajpayee also plays an important role in the film. Siddharth told Amitabh Bachchan and Saif Ali Khan the most stylish personality and Sonam Kapoor and Priyanka Chopra as the most stylish women.